Amazing cleat story here – after two and a half years and at least 25,000 miles I had to replace my speedplay zero cleats this morning. I knew that there was a problem about a week ago when the right cleat was loose even with the tension screws closed all the way down. It turns out that I had sheered off a plastic tab that helps hold the locking mechanism in place. It’s hard to tell in the blurry picture, but you can wiggle the locking mechanism with your hand even though it’s supposed to be secure. So today I installed a replacement cleat, and I thought the warning message was hilarious in light of the miles that I had on the shoe. 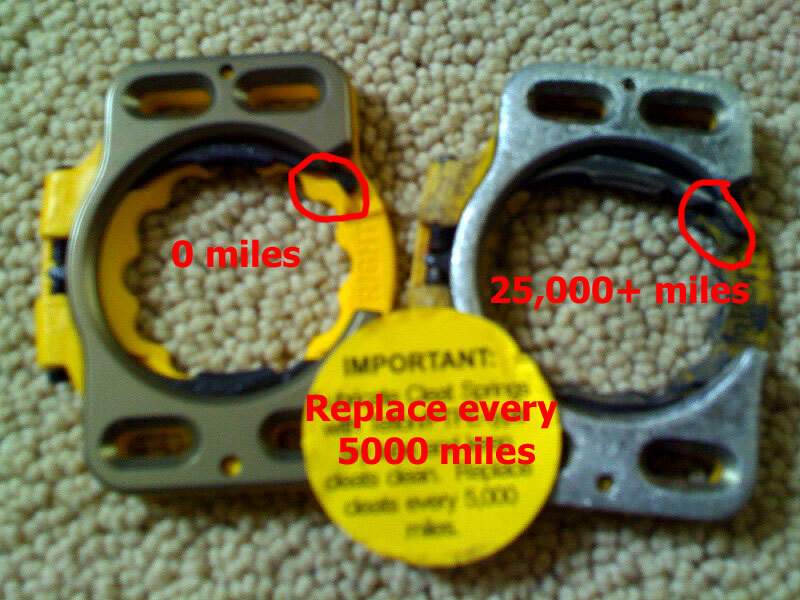 It says to replace the cleat every 5,000 miles! Mine lasted 5x longer than that! Tonight’s the Charlotte Criterium (Presbyterian Invitational) and I’ll be posting my race report sometime tomorrow – hoping to get more points in the USA crits series to keep my top 10 standing (I’m currently 7th by 1 point). This entry was posted in Misc and tagged equipment, speedplay on August 7, 2010 by kartoone. I didn’t know the off-season could be this busy! The 2008-2009 BBL season is underway! I am managing the website for the series, and we have really stepped it up this year with organization, prizes, etc… I rode the inaugural weekend but was then out of town last weekend for a conference, and this coming weekend we will be on our way back from Thanksgiving with family in Northern Indiana. My Garmin Edge 705 bike computer / GPS unit arrived in the mail yesterday morning. I brought it with me here to Indiana where I am sitting in a coffee shop trying to get caught up on a few things while Kristine and the kids nap. I will write up a detailed review of my experience with the Garmin after my first few rides with it. On an interesting side note – I am writing from Rocky Mountain Cafe – a very cool coffee shop in La Porte, IN. My large mocha was a bit expensive ($4.50), but I have unlimited access to free wireless. This is compared to the other wifi hotspot that I tried – Temple News Agency – where I had the option of paying $4.25 for a large mocha and then paying not $1, not $2, not $3, but $4 for one hour of wireless connectivity. Hmmm, let’s see – $4.50 plus free wifi or $8.25 plus the opportunity to sit in a small cramped building with somebody smoking inside it. I’m glad I just smiled and said “thank you” and left the first spot! Finally, it looks like I’ll be doing a couple days of cold-weather riding up here on snow-free roads surrounded by a beautiful snowy countryside up here in La Porte, IN! They had a lake effect snowstorm that dropped about 10 inches of snow a few days ago and all of it has melted from the roads which are completely dry and yet the fields are still covered in snow! It doesn’t get any better than that for a biking southerner who doesn’t get to see snow very often! This entry was posted in Training and tagged equipment, travel on November 26, 2008 by kartoone.